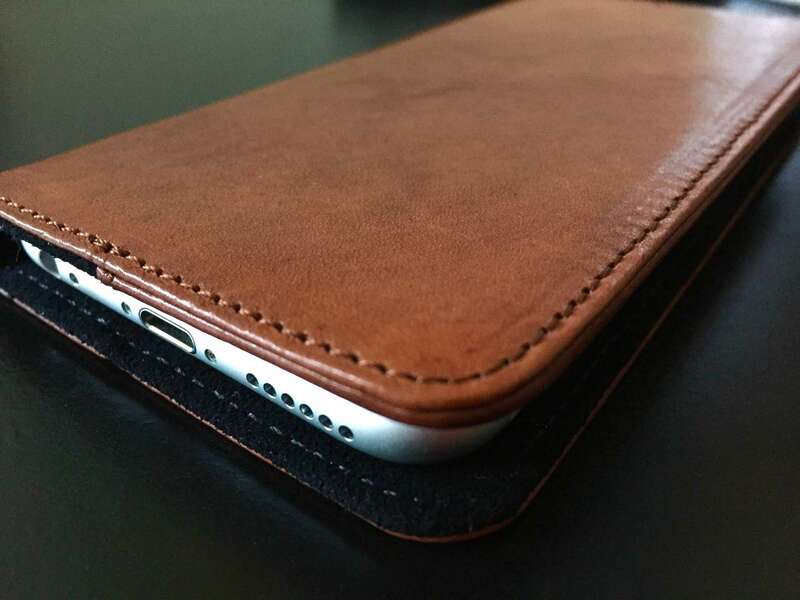 This Italian leather case also attaches with the Micro Dock from Nodus. I go through phases of different cases that I like to style my iPhone with. Back in the day I used to like clear cases just to show off the fact that I have an iPhone at all, but lately I’ve been really digging leather. 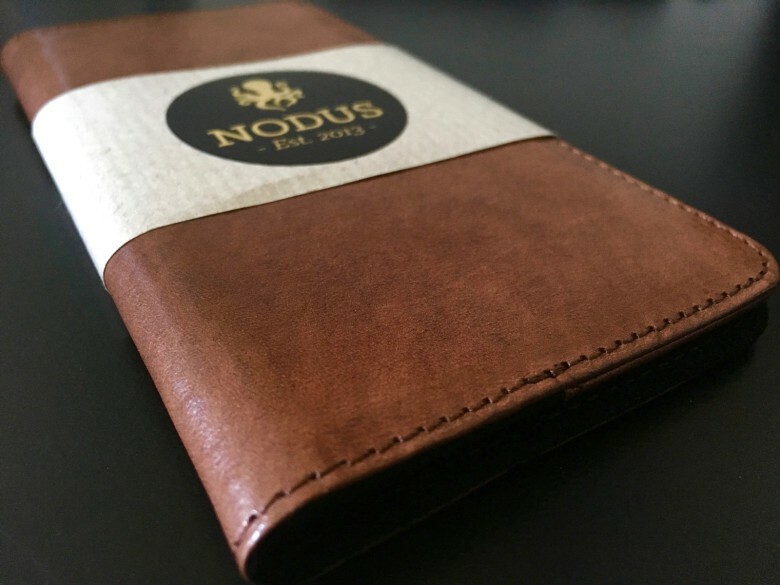 That’s why I was particularly excited to try out the new Access Case 2 from Nodus, but it’s more than just good looks. It works as a compact wallet and dock for your phone as well. Yes, an actual dock. 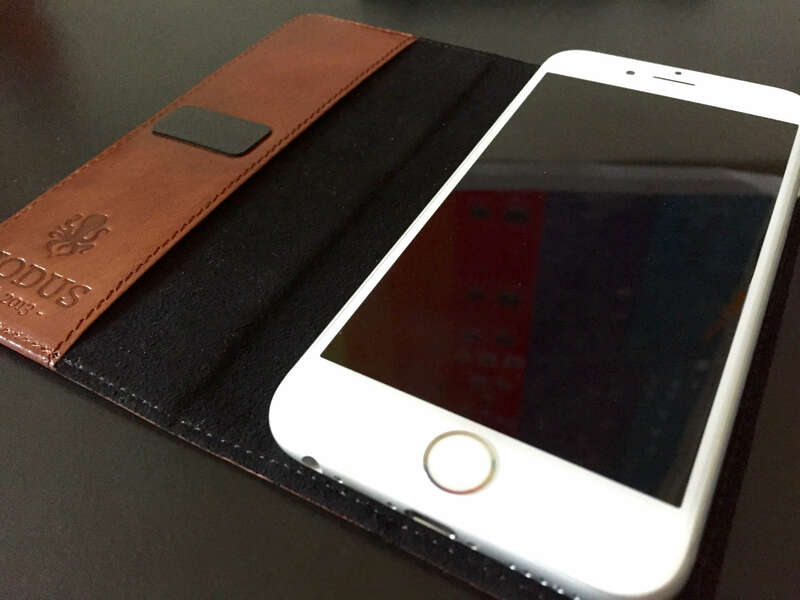 The case has a folio design, which means it wraps around your iPhone with a flap that covers the front. 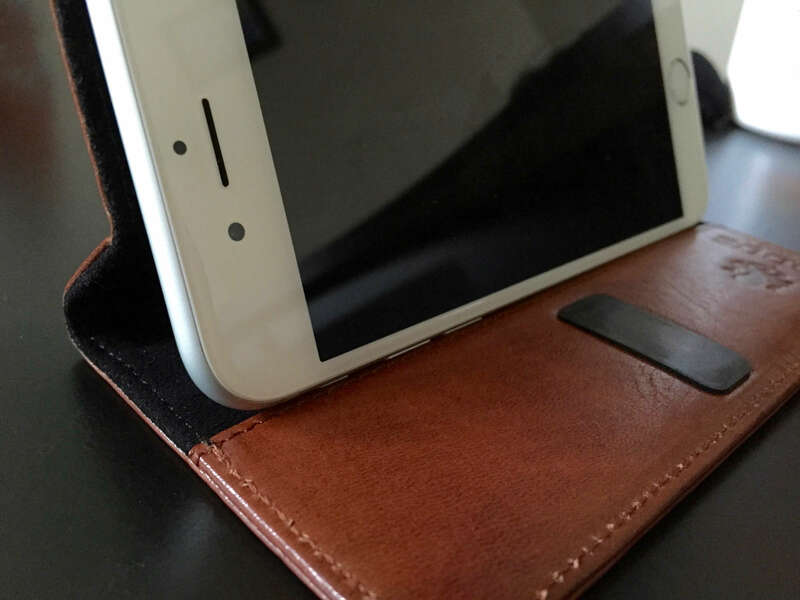 It’s made with tanned Italian leather nice enough to turn your iPhone 6s into a fashion statement — even for me, and I’m known to wear sweatpants even in the most inappropriate social situations. The inside is lined with microfiber to prevent scratches on your device and features two areas of micro-suction. One large strip on the right side secures your iPhone and a small strip on the left side ensures flap stays closed when you fold it over. The iPhone stays attached to the Access Case 2 via micro-suction. The micro-suction does a good job of keeping the iPhone in place without leaving a sticky residue when you pull it off. I do worry though that in the case of a drop, the iPhone might slip out. The micro-suction is strong enough for regular use, but might not do the trick for clumsy folks. When you open up the case, you’ll notice a pocket on the left side. That’s your wallet for storing cards and cash. I fit four cards in the slot before the case started to feel unreasonably bulky to me, but those cards did all have embossed numbers on them. You can probably fit about six flat cards in there. I also did a vigorous shake and was pleased that not one card moved in the slightest. Even when I took all but one out, the one card was still snug. The left slot fits some cash and cards for safe-keeping. Access Case 2 also has a crease on the back, which folds back the case and supports the iPhone as a horizontal stand. Apply pressure to fold back at the crease as far as possible to get the iPhone to stay put. Once you get it, it works pretty well for something made out of leather and microfiber. It’s not perfectly sturdy, but it’s appreciable for browsing Safari or watching a video while you’re sitting at a table. Perhaps the most interesting part of the Access Case 2 is its compatibility with the Micro Dock. This separate accessory from Nodus is a tiny block that can attach to any vertical surface with adhesive and, using magnets built into the dock and Access Case 2, can mount your iPhone pretty much anywhere. The case folds into a stand to free up a hand. Though I didn’t get to test it out, the Micro Dock seems like a pretty cool little gadget. Even nicer is that the Access Case 2 (and Nodus’s Shell Case) works with it out of the box. The extra feature does come at an extra cost though, and that cost is £14.99 for a two-pack, which converts to $23.15 for those of us in the U.S.
As for the Access Case 2 itself, it provides only mild protection, but with a healthy dose of style and function. It’s currently available for pre-order through Nodus for £39.99, or $61.76, and comes in black, brown (above) and yellow. It’s not the best value at that price especially if you’re looking to buy the Micro Dock too, but the premium feel plus wallet and dock combo are still enticing. The case should start shipping in late October. Update: The developer has pointed out that if you buy the Access Case 2, you get the Micro Dock shipped free as well. That’s a significantly better value to consider.